The laser pointer is a low cost portable laser that can be carried in the hand. It is designed for use during presentations to point out areas of the slide or picture being presented, replacing a hand held wooden stick or extendable metal pointer. It is superior over older pointers because it can be used from several hundred feet away in a darkened area and because it produces a bright spot of light precisely where the user desires. It has also caught on as an all-purpose pointing tool and has become so commonplace that laws have been passed to restrict its use. Which is the most powerful handheld laser ? Here is a 2W blue handheld laser, while this one is 1W green handheld laser. Both of them are very powerful, the green one is 1W, however the green laser is very bright. Technically, the word laser is an acronym that stands for "light amplification by stimulated emission of radiation," but the term has become so commonly used that it is no longer capitalized. The radiation is the light that is emitted from the laser; this light can be visible or invisible to the human eye. Technically, only some lasers use light amplification, but the name laser is still used for a device that produces monochromatic (all one color or wavelength), coherent (the light waves are similar enough to move in one direction) radiation. All lasers have a lasing medium, a source of energy, and a resonator. The lasing medium is a material that can be pumped (energized) by an energy source (such as light or electricity) to a higher energy state. After being pumped, the lasing medium can release that energy as monochromatic radiation. The resonator is an area that allows the released energy to build up before being released. A basic resonator is a pair of mirrors at either end of the lasing medium. One mirror is completely reflective so that all light striking it reflects back into the lasing medium; the other is partially reflective so that some of the light striking it reflects back into the lasing medium and some of the light passes through it to exit the laser. The pair of mirrors causes the light to reflect back-and-forth through the lasing medium and align itself in one direction, which produces the coherency of the light. The theory used to produce lasers was published in 1958 by researchers at Bell Labs. The first laser, built in 1960 at Hughes Aircraft, used a piece of ruby for a lasing medium, light for an energy source, and mirrors to produce a resonator. The semiconductor laser was invented in 1962. It used a semiconductor material, similar to the materials used in transistors and integrated circuits for a lasing medium. It also used direct current (DC) electricity, the current produced by batteries, for an energy source. It still used resonator mirrors. The first semiconductor lasers produced non-visible infrared radiation. Current semiconductor lasers can also produce visible light, with red being the least expensive type of semiconductor laser and green, blue, and violet being increasingly more expensive. Semiconductor lasers used in laser pointers are also known as diode lasers, because they are a type of semiconductor diode. A diode passes electricity easily in one direction; light emitting diodes and laser diodes produce light when electricity passes through them. Semiconductor electronics have become less expensive to produce since the late 1950s. They have also become smaller and require less energy. They became inexpensive enough to be used in consumer electronic devices such as laser pointers in the 1980s. Current laser diodes are the size of a blood cell. They produce light that is less collimated (moving all in one direction) than most lasers because the shortness of the resonator space. Because of this, they need some sort of external optics (lenses) to focus the light into a tighter beam. Laser diodes, like many semiconductor devices, are delicate and need to be protected from the environment and from power surges. Power control circuitry, which usually includes a photodiode (a diode that produces electricity when light strikes it) to monitor the output of the laser diode, prevents the diode from receiving too much or too little power. The diode is protected from the environment by a plastic case so that is resembles most other semiconductor devices that are used on circuit boards. The first laser pointers cost hundreds of dollars, but the demand and improved methods of fabrication have resulted in a price below five dollars for the most inexpensive types. There are also several items which incorporate laser pointers, or at least the components, such as laser sights for guns and projectors with built-in laser pointers. A laser diode is less complicated than many types of consumer electronic equipment. It consists of a laser diode, a circuit board, a case, optics, and a case. Some of the electrical components on the circuit board and the laser diode are made of semiconductor materials, metals, and ceramics. The semiconductor materials include compounds (materials made of more than one pure element) made of aluminum, gallium, arsenic, phosphorus, indium, and similar elements. These compounds are used in a variety of semiconductor products. Semiconductors also contain metals such as aluminum, gold, and tantalum. The circuit board is typically made of a resin (plastic) such as epoxy with glass fibers in it to strengthen it. Electricity is conducted to the various components on the circuit board with lines of metal such as aluminum and copper. Individual components placed on the circuit board include diodes, the laser diode, capacitors, and resistors. Semiconductor parts, such as the diodes are encapsulated in plastic with metal leads that are connected to metal pads on the circuit board with solder (a metal alloy traditionally made of tin and lead, but now containing less lead and other metals as substitutes). Non-semiconductor parts, such as resistors and capacitors, are made of a variety of metals, plastics, and ceramics (including glass). The collimating optics can be glass, but less expensive acrylic plastics are used in most laser pointers. The case can be made of any material, such as metal, plastic, or even wood. It contains metal (usually brass) contacts for the batteries. The design of the laser pointer depends on the electrical requirements of the laser diode, the desired lifetime of the power supply, and the drive to produce smaller consumer products. The smallest laser pointers are less than two inches in length, but some laser pointers are designed to look like pens. The longer laser pointers can hold AAA or AA batteries, which provide a longer lasting power supply than the watch batteries used in the shorter laser pointers. Most laser pointers use two or three batteries. The red laser pointer is the most common laser pointer. Other laser pointers use different laser diode assemblies, but are produced in a similar fashion, so the red laser pointer manufacturing process and diagram are used in this article. The laser diode is produced in a semiconductor fab (a factory where semiconductor materials are produced in very clean and carefully controlled conditions). The substrate is the base material on which other materials will be deposited. A wafer of the substrate is produced, cleaned, and prepared. Then it goes through several steps where layers of material are deposited on it. Some of these layers are only several atoms thick. These layers can be conductive (metals such as aluminum and gold) or semiconductors (as described above). These layers can also be altered by exposure to other chemicals. After all materials are added to the wafer, it is diced (cut apart, usually into rectangular sections) into individual diodes. The diodes are tested either on the wafer or after separation, and nonfunctioning ones are scrapped (thrown away). Working laser diodes are then packaged in a plastic container with metal leads for electrical connection. The circuit board contains the circuitry that makes the laser pointer function. It contains the switch, the laser diode, and the components of the control circuitry, typically a photodiode, diodes, resistors, and capacitors. These parts are placed on the circuit board, sometimes with an adhesive, and then are soldered in place. Soldering is a process where two metal objects are placed in contact and solder is melted around them so that when it cools, it surrounds both of them and holds them together. Solder is used instead of glue because it sticks to metal and because it conducts heat and electricity. The collimating optics in a laser pointer consist of a single lens that focuses the cone of light exiting the laser diode into a narrower beam that produces a narrower spot over a longer distance. Plastic lenses are injection molded, a process wherein molten plastic is forced into a mold. The plastic cools and solidifies, then the mold is pulled apart and the lens is removed. It is ground and polished to a smooth surface so that the light from the laser diode will not bounce off of imperfections on the surface. The laser diode and the collimating optics are put together with a plastic holder to form the laser diode assembly. Most laser diode assemblies have a metal spring attached at the back. This spring makes contact with the batteries in the laser diode and is part of the circuit that draws electricity from the batteries. The case is a tube with space for the laser diode assembly and the batteries. The laser diode assembly is pushed or screwed into one end of the case. The interior of the case is made of brass or has a brass strip (glued or riveted in place) running down the battery space. The battery space end piece also has an exposed brass area or is made of brass. When this end piece is pushed or screwed into the case, it contacts the other side of the batteries to complete the electrical circuit that allows electricity to flow from the batteries to the laser diode assembly. The case also has a switch button (a piece of plastic sticking through a hole cut in the side of the case) that must be pushed and held for the laser pointer to work. When this button is pushed, the switch on the circuit board closes, electricity flows from the batteries to the laser pointer assembly, and the laser pointer produces a beam of light. After the laser pointer is assembled and tested, a safety label is added. This label describes the rating of the laser in terms of power output, notes which regulations govern its use, and warns the user to avoid direct eye exposure. A semiconductor manufacturer uses highly controlled processes that have been developed in laboratories and then transferred to the fabrication facility. Laser diodes are tested to make sure that they work after fabrication as well. Each other component is also tested to make sure that it works. Most manufacturing facilities will randomly test their products and use statistical control methods to provide quality products. When the laser diode assembly or the laser pointer is finally assembled it will be powered and tested with a light detecting device, such as a photodiode, to measure its power output. Laser pointers are Type IIIA laser devices and must produce 5 mW (milliwatt, one thousandth of a watt) of power or less for the United States market. 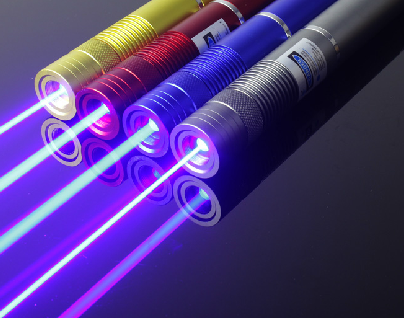 Laser pointers for the European market are typically Class II laser devices and must produce less than 1 mW. These restrictions are for safety purposes. Laser pointers contain metals, plastics, and electronic parts. Each of those industries has specific waste byproducts (solvents, halocarbon gases, lead, chemicals), but laser pointer assembly has no specific wastes until the laser pointer is disposed of. A laser pointer contains small amounts of hazardous materials, such as lead and some toxic semiconductors. Like other electronic assemblies, it may be safer for the environment in the long term to recycle the components, though this is expensive and there are few programs in place to recycle or reuse electronics. This may change in the future. Red laser pointers are the least expensive and most common today. Green laser pointers have more complicated laser diode assemblies and cost hundreds of dollars. Blue and violet laser pointers will be available soon at a higher price. Newer laser diode types come down in price as production volumes increase in order to keep up with demand, and as production processes improve. Laws that restrict laser pointer use may counteract this trend by causing a drop in demand as laser pointers are banned from public places.